Technical - Options for an F1 steering box | The H.A.M.B. Discussion in 'Traditional Hot Rods' started by magnus13, Aug 2, 2018. Hey guys, I'm looking for some suggestions here. I picked up a 48-52 F1 steering box. Opening it up everything looks to be in really good condition so it doesn't need a total rebuild. Only thing, is the shaft was cut right past the end of the worm gear. I can find a lot of rebuild kits that include a new shaft and gear already pressed on, but can't find any replacement shafts only or any columns. So my question is, what kind of options do I have here? -Should I replace the whole shaft/worm gear assembly and look around for a column mast? -Is it possible to adapt an F1 boxes (that's been cut) to an aftermarket column, like Limeworks? what steering wheel and column are you running?? I used a piece of exhaust tubing for a column and mounted up a boat wheel to the shaft. The actual shaft diameter is the same on 30's and 40's Fords up through the F-1. You can use a donor shaft out of another assembly if have one laying around. If you want to use a tapered hole steering wheel, now is a great time to switch to the appropriate shaft (30-48 passenger car), and maybe even cut it to the correct length for a custom application. Note the worm will be VERY hard to press on, so use something to cushion the threaded end of the shaft during that operation. I have about an inch of shaft left on the worm gear, so it'd be possible to weld to it. I'm planning on running a 40 steering wheel so it sounds like I have options with the earlier models. Besides a press, how is the worm held on? Is it keyed or pinned somehow? Worm gear is keyed and held on by a very tight interference fit. I usually cut them lengthways to get them off. If you want to save it, heat it up and hammer might work. Likely it needs to be replaced even if it looks good. Talk to @NealinCA . He can set you up. I don't think the keys are true keys. They seem to me to be a sort of interference key. Something that cuts into the shaft when the worm is pressed on. Anybody know different? Never done it but neal said he could press a tapered shaft into an f100 box so I think there are many possibilities for the more popular f1 . Aussie rods need a collapsible column to get registration so I modified an old DD solid shaft piece to press into the F1 worm and then used a standard Ford splined top DD shaft on the steering wheel end. I used a Borgeson DD tube to join the two together and made the outer tubes telescopic too. I used a 1950 shoebox wheel that has a standard Ford splined hub, you will lose the original horn wire function unfortunately. Never thought of that. it's possible. I've replaced a few worm gears, but have never seen a new, bare worm shaft. Always re-used that part. I cut my F1 or 100 shaft about 8 inches up and use a piece of early shaft to the wheel. Once I get the length right i use a piece of .750 ID 1/8 wall tube about 8 inches long to join them. I drill holes in tube and weld holes and ends. That keeps the shaft hollow for wires. barrnone50, bchctybob and sloppy jalopies like this. I vote to have someone do a quick tech thread on how to press the worm gear on and off.... I'm sure it's harder than it looks and it would be a good skill to learn! magnus13 and hendelec like this. You are correct , I just pressed a new one on a shaft yesterday. There is a keyed spline and the rest of the splines are more of a cut as you press them onto the shaft making it a very tight fit . The37Kid and deathrowdave like this. Is the end of the shaft on the original F1 tapered to fit a 40 wheel or is it splined? I've seen some replacement shafts that show both, but they're both spec'd for a 48-52 F1 box. I'm pretty sure all the F-1's are splined. I'll do it. someone send me an early ford tapered shaft. I'll pay shipping. Nailhead A-V8 and magnus13 like this. also, check with jim at antique auto in rosemead. a few years ago,i bought a repro '40 steering shaft from him. [shaft only] i think he had more. '40 shaft is same as f-1, except it has a keyway instead of splines. Please have qualified weld complete any welding to steering parts . 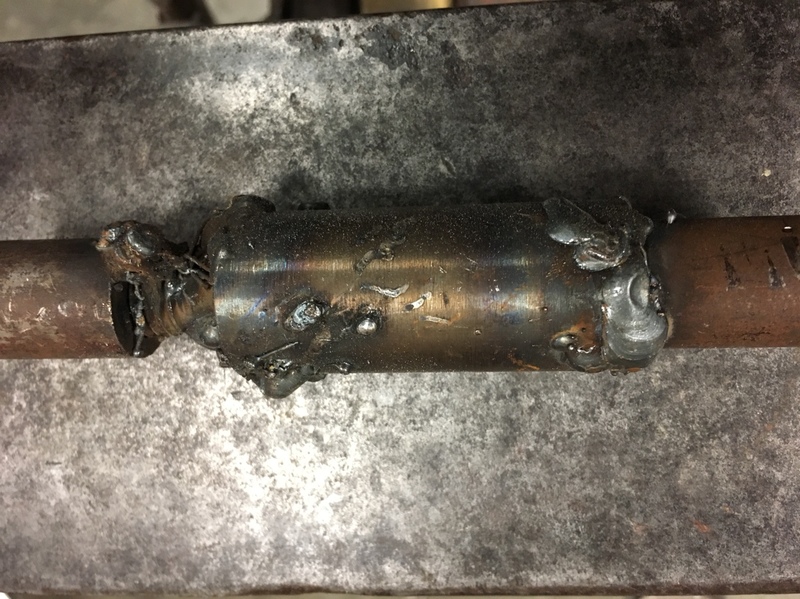 The photos in a previous post of steering shaft welding are so scary its not a joke ! Since this is about options on f-1 steering, my option is use something else. I'm using a steering box from a mid 60's Dodge pickup. They used these up to 1971 and they fit on about the same - three bolts through the frame. The advantage is that they have a splined shaft going to the steering column. Use an aftermarket street rod u-joint and hook up to any column you want. RMR&C and magnus13 like this. So....this guy needs to practice a little ? That's insane. 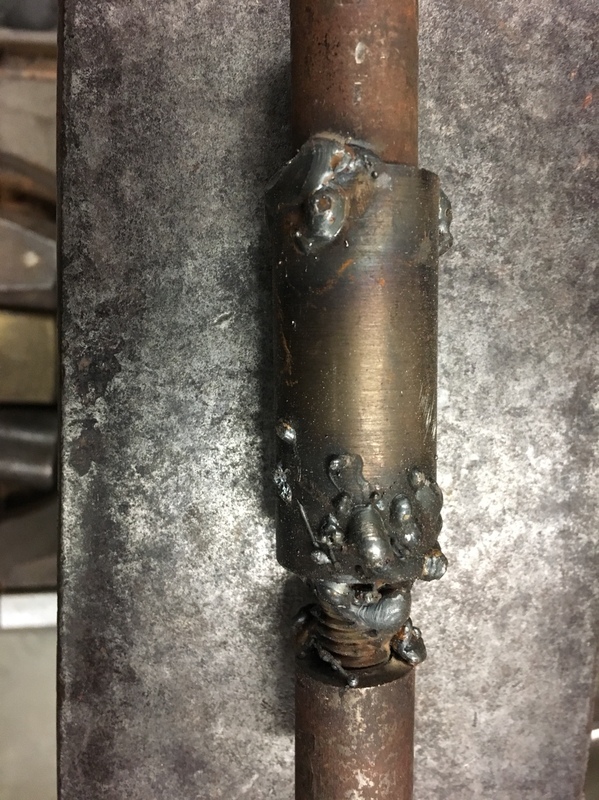 Even if your welder settings we're halfway close, and you were blind, you could still do better welds than that. If you want horn and turn signals with a small tube for the column use an early Nova that came from the factory with a floor shift. I prefer 14/15" & 17" flat sprint car steering wheels with vulcanized rubber grips, so there is no problem because you can use an adapter and the marriage of the steering shaft can be interdominational. For automatic transmission, use '54 Ford column. It is small and is on column. (In case you mate Flathead to Fordamatic, as it is possible with an adapter (so the Missus, or older rodders can hotwire your flapdoodle and take it for a spin.) Or, there are other options if you want cross-steering. I recently saw a very nice short door '41 business coupe with Saginaw power steering that ran a Flathead, because the owner wanted it that way. Recirculating ball boxes on vehicles that run on today's road surfaces, that in some places have craters like on the moon, is just a matter of notching up the engineering to keep yourself safe; always part of a tradition that goes back to our cavemen days. Or, you are making a traditional rod, try to use traditional gasoline, you'll find it has become extinct, like Dino, the dinosaur. If you know the reference. My motto: If it breaks fix it (to go) faster. All who have the hot rod madness, rave on! The Big Kahuna in the heavens has not dropped the checkered flag, yet! And, good luck with your endeavors, sir. Other Hamboholics, have posted some tasty ideas I am going to remember for future reference. Also, there are probably more F-100 boxes left, than F-1's. Vern Tardel had some things to say about them both. You can use either one. Same result and less hassle in rebuilding and repair. Golden West Suspension has oversize bearings for some applications. Doug Nordin is the man. See him. He can make your suspension and steering box issues disappear --- for a little of the green stuff. Not the kind goes up in smoke and is used in peace pipes! Hi ,i just read this post …..i adapted my F1steering box to a Limeworks banjo style steering column, i cut the F1 shaft and connect all with a steering joint…...3/4'' round X 3/4-36 spline….the Limeworks has a 3/4-36 spline shaft….i need to do this to get space …. A wire feed welder with some flux core wire, turn the power up, and anyone can weld. ^^^ An awful lot of people feel that way these days ^^^ trouble is, it ain't true!